3 Is VIGO A Good Choice For Your Kitchen? VIGO is an up and coming faucet manufacturer that surprises with innovative designs and high-quality products. They are based in the USA, and they strive to produce high-end kitchen faucets that not only look good but are functional and dependable as well. Did you know that VIGO produces their deck plates in the same factory as the faucets to be sure all the finishes are identical? Despite the fact that most people haven’t heard about VIGO, their products are very good and surprisingly cheap. You will be able to buy high-quality pull-down faucets produced by this brand with a fraction of the price you would spend on a similar one produced by a different manufacturer. And the best part is, VIGO products might be better than the others. 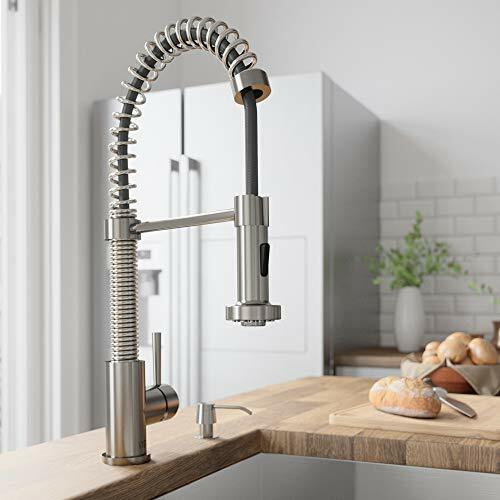 Read our small selection of VIGO faucet reviews to learn which are their best products in 2019, and to find the right model for your kitchen. Now that you’re more familiar with this manufacturer, let’s take a quick look at some of their products. 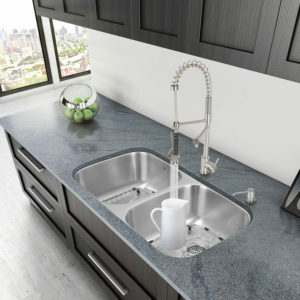 If you’re looking for a high-quality pull-down faucet that comes at a decent price, you don’t have to look any further. The VIGO Graham is the perfect model for what you need. 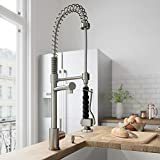 This faucet has a stylish design and it will look great in every kitchen, whether they have a modern or a traditional design. The faucet is made out of brass for an increased durability and it comes with a spray face that will resist hard water buildup for an easier maintenance. The faucet uses a ceramic cartridge for a long-lasting drip-free use. Deckplate Included – The VIGO Graham comes with a matching deck plate, so you can cover the unused sink holes. The deck plate looks great, and it will improve the faucet’s aspect. Easy Installation – The faucet is very easy to install, and most people will be able to install it themselves without any problems. Pull-Down Without Magnet – The pull-down sprayer doesn’t have a magnet, so it will be slightly difficult to push it into the docking station. Conclusion: The VIGO Graham is a good-looking faucet that comes at a great price. The faucet has a functional pull-down design, but the sprayer could be better designed. When you want to build an impressive kitchen, you have to find the right fixtures and appliances for the job. The VIGO Edison is one of such fixtures. 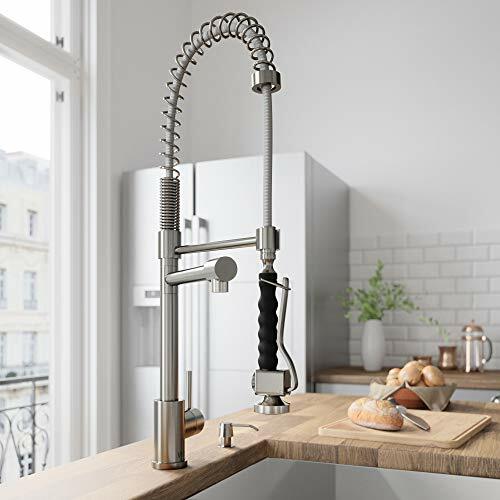 This kitchen faucet has a modern design that will make it the centerpiece of the room, and it’s the type of faucet that will bring you a lot of compliments over the years. The faucet has an open coil design that’s bound to be stylish for years to come. The pull-down spray head can produce two spray patterns. The stream pattern is good for everyday use, while the spray pattern is very good for removing difficult stains. Awesome Design – The open coil design looks great, and it will be fashionable for a very long time. Valve Leak – Some customers complained that the faucet might leak around the valve. If this is the case, contact the customer service right away as the valve is covered by the lifetime warranty. If you’re looking for a faucet that comes with a pre-rinse spray, but you’re not willing to break the bank to buy one, you should take a closer look at the Zurich model developed by VIGO. 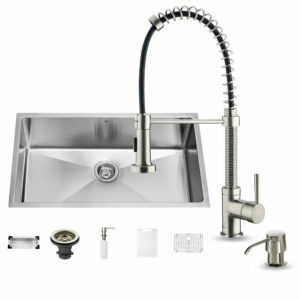 This faucet has a solid brass construction for an increased durability, and it comes with a pot filler and a sprayer. You can either use the pot filler and the sprayer separately or use them at the same time. However, if you decide to use them at the same time, the water pressure will be halved on both. Great Price – If you’ve been looking for a faucet that comes with a pot filler and a sprayer, you might have noticed most of them are a lot more expensive than this model. Powerful Sprayer – This faucet comes with a powerful sprayer, so you won’t have any problems using it to remove stains from pots and pans. Low Pressure – Some customers complained that the sprayer has a low pressure. This might be true, especially if your water pressure is low, to begin with. However, you can fix the problem easily if you remove the flow restrictors. Conclusion: The VIGO Zurich is a good faucet that comes at a great price. If you think the faucets’ water pressure is too low, just remove the flow restrictors. VIGO is a US-based luxury kitchen and bathroom products manufacturer. They are not very well known yet, but they are up and coming and one of the companies with the biggest potential for development. At VIGO, they strive to produce luxurious kitchen and bath products that not only look good but are dependable as well. One of the reasons why you should keep your eye on this company in the future is the fact that they put a lot of effort into innovating and designing new products. A great thing about this company is that they have really professional customer service assistants. All of them know the products, so they will quickly understand what your complaint might be about. You can quickly contact the customer service through phone, email, or you can use the live chat option on the manufacturer’s website. The customer service specialists will understand your problems quickly, and they will offer clear solutions on how to resolve them. They will send the replacement parts and even new units if they consider it necessary. All of their faucets come with a limited lifetime warranty, and they have matching finishes with the deck plates, so they will look great in your kitchen for a very long time. Is VIGO A Good Choice For Your Kitchen? VIGO is not a well-known brand, despite their high-quality products. They are still a relatively new manufacturer, but don’t let that discourage you. You can actually use that to your advantage, as their products tend to be cheaper than the competition. In the following section, we take a closer look at what they implement in their products. VIGO is a luxury faucet manufacturer, so every model they develop looks amazing. Their faucets are well-designed, and they offer a nice blend of aesthetics and functionality. Here is a list of the most frequent characteristics you’ll encounter in a VIGO faucet. – All VIGO faucets come with a single handle. This makes the faucets easy to operate, and you will be to change the water’s temperature with a simple push or pull of the handle. Thanks to the spout’s swivel, the handle can be placed on both the front and the side of the faucet. 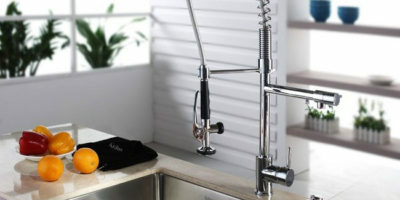 – All the faucets manufactured by VIGO come with a swivel spout. This is a good feature, as it will allow you to clean dishes easier and give you more clearance around the sink. – All the kitchen faucets produced by VIGO come with all the mounting hardware you will need for the installation. This is a great advantage, as you won’t have to spend more money on hardware. – VIGO produces all the deck plates in the same factory with the faucets. This is an insurance that they will always have the same finish as the faucets. Don’t worry if the deck plates look slightly different in the pictures. These differences are often the fault of pictures or monitors resolutions. – All the finishes used by VIGO are top notch. They are very durable and will endure a lot of wear and tear without scratching. The finishes will look great for a long time with minimal maintenance. – VIGO kitchen faucets often cost a fraction of the price you would spend on a similar model developed by another manufacturer. The cost is not a reflection of the products’ quality, but rather a reflection of the manufacturer’s renown. – All the standards and codes applicable are followed in the construction of every faucet. This makes the faucets good for every area in the country. – Most of the faucets produced by VIGO are suitable for a single hole installation. This makes them suitable for all the sinks currently available on the market. If you want to hide the other holes of the sink, you only have to use a deck plate. Some models come with a free deck plate. You can find spare parts for the faucets on the manufacturer’s website. You can also find them online at several retailers. If you have any problems with a VIGO faucet, you can contact the manufacturer’s customer service and ask for guidance. VIGO offers a limited lifetime warranty for every faucet they produce. The warranty will cover all the defects based on the manufacturer’s fault. The faucets have to pass several tests before they leave production, so you can be sure that they will be delivered without any defects. VIGO has a good customer support service. You can contact their expert via email, phone, and you can even use the live chat option on their website. Their customer service professionals know the products, so they will provide important information for everything, from the installation to faulty products. VIGO is a luxury faucet manufacturer, and they strive to combine exquisite looks with functionality and durability. 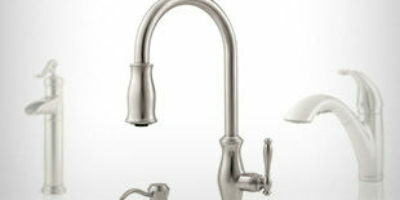 Their faucets use modern technologies to provide the best experience in the kitchen. Here is a short list of the technologies used by this manufacturer. 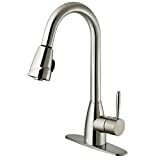 Pull-Down Faucets – Some of the faucets have a pull-down design that will be of great help in the kitchen. These faucets produce two types of spray patterns, each of them better for different tasks. Pre-rinse Sprayer – Some models come with a pre-rinse sprayer. Unlike the ones that use a pull-down sprayer, these ones have a separate pot filler that can be used. When the handle of the pre-rinse sprayer is activated, the water flow is directed from the filler to the sprayer. Pull-Out Faucets – Some of the kitchen faucets produced by VIGO have a pull-out design. These faucets are smaller than the ones with a pull-down design, but they can be used similarly. 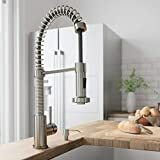 We’re certain that after reading our selection of VIGO faucet reviews, you are now able to find a good model for your kitchen at a cheaper price than you had in mind. Their faucets offer everything the ones produced by better-known manufacturers do, and they only cost a fraction of the price. If you’re looking for a pull-down model but you’re not willing to spend a lot of your hard-earned dollars on one, VIGO is the company you should be looking for. Not only do their products look great, but they are very dependable and durable as well. VIGO faucets are covered by a limited lifetime warranty, so you can contact their customer service at any time if you encounter any problems with their products.